I was given this story free just for joining the author's reading list. Me and freebies get along great. Civilly Disobedient, does everything you want a short intro story to do. We meet the characters, at least some of them. We get a brief look into the world being built, in this case one where civil rights aren't guaranteed and food is a bit hard to come by; and we get a glimpse into what is going to happen or at least what might happen. I was impressed with this short story by Ginger Booth. So much so I purchased the books in the series just so I can see what happens. I want to know. 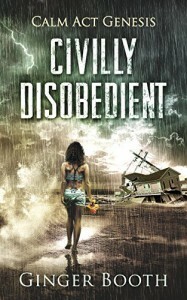 Civilly Disobedient introduces us to Dee, our main character in this story. We see a few days through her eyes. She's a bit privileged and knows it enough to see how lucky she has it but how something needs to be done to help others. According to the blurbs on the series there is a whole conspiracy going on and we get to see it from the eyes of those involved from Dee to the military and hopefully it's as good as this first story. The author's writing is easy and fast. No big words to bog me down or ideals I can't recognize. There is a bit of familiarity to the writing like, I've been here before but not so much that you put the book down or figure out what happens before the author wants you to. If you are looking for a quick dystopian story that isn't cheesy or so convoluted it can't happen then try this out and if you finish the Calm Act series before I do.. don't spoil it.